1. If you want a grandstand seat, you need to order it early from the ACO or one of the ticket agencies like 1st Tickets. You can expect all grandstand seats to be sold long before the Test Day. Seating in the grandstands is free during qualifying (except for 17 (Durand) and 18 (ACO) which are only available to ACO members). 2. If you want a good spot on the tribunes - get there early! For the 3 pm race start, you really need to have claimed your place by 12-12.30 pm - especially if you're in a large group. The Dunlop Chicane, originally created for the 1987 race and made much tighter in the years since, is followed by the sweeping right/left section between the Dunlop Bridge and the Esses which was created 15 years later. 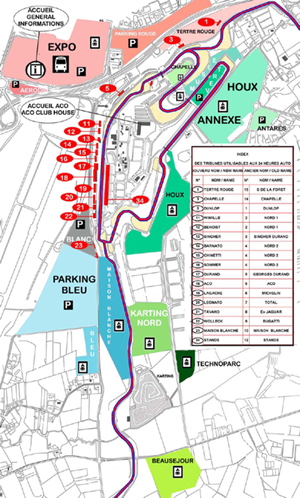 The Dunlop Chicane is a popular viewing area and has a dedicated grandstand "Dunlop" (No.5). It gives a good view of the chicane (the Tourists frequented it in 1990 and I also sat in it in 2007). Many fans are eager to see the cars the run down to the Esses so this area is even more popular than ever. 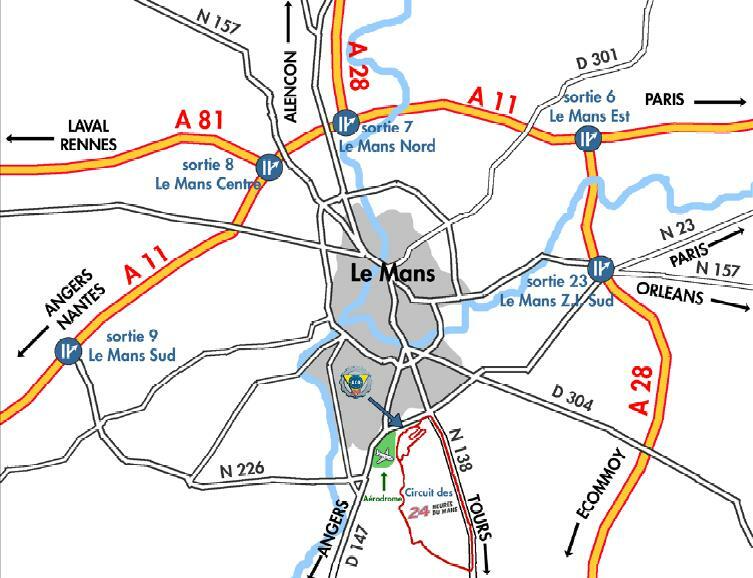 Walk down from the famous Dunlop Bridge and then up into (what is left of) the trees to watch the cars as they sweep around into the Esses and on down to Tertre Rouge. A fantastic spot to watch for a while at night... 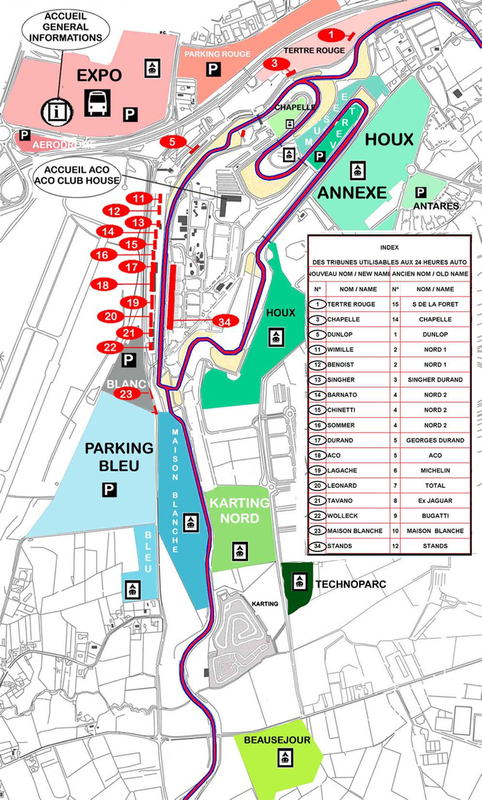 There is a grandstand here called "Tertre Rouge" which actually overlooks the Esses. Its the only grandstand which is situated some way away from the start-finish line. (I was in it during the night in 2006....). 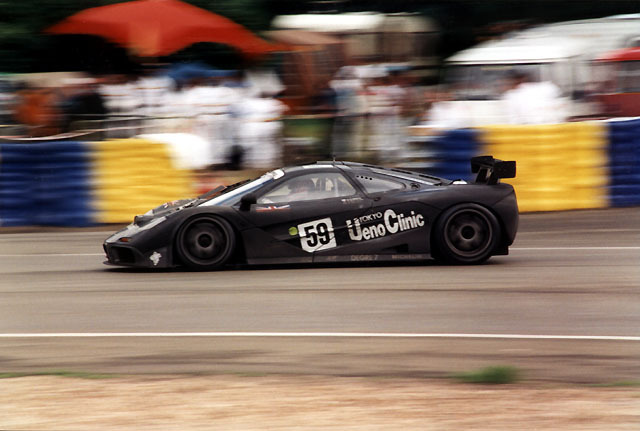 Once through the Esses, the cars power down to Tertre Rouge ("red hillock"), a vital right-hander which propels the cars onto the famous Mulsanne Straight which was streamlined in 2007 and is now much faster. Good light trail shots can be had from the inside here if you can only throw your lens wide open sufficiently to avoid the ever-present debris fencing. It is another great place to watch during the night, as cars often come to grief in the kitty-litter on the outside when brakes tire and driver concentration begins to wane. There is an underpass at Tertre Rouge which you can use to get into the inside of the circuit to watch from the raised viewing area there. A very good spot - my favourite, in fact. 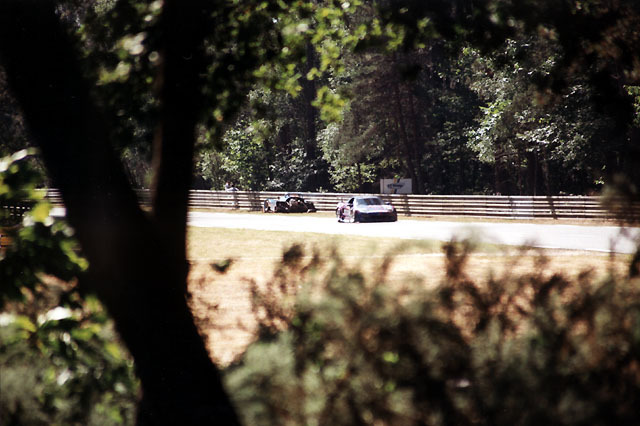 The photograph shows cars heading away from Tertre Rouge down the Mulsanne and was taken in 1991 from the garden of one of the houses there. Sadly, unless you're good friends with the owners of the houses, you won't get there.... Tertre Rouge was reprofiled for 2007, one of the few changes to the track which has been for the better. A great view for spectators - day or night - plus a big TV screen for good measure! 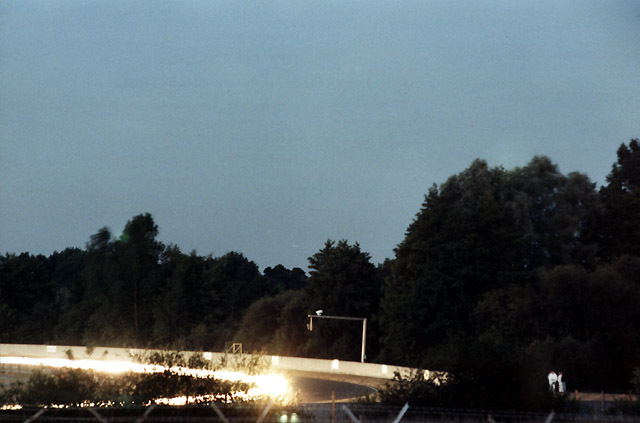 The legendary Mulsanne Straight..... 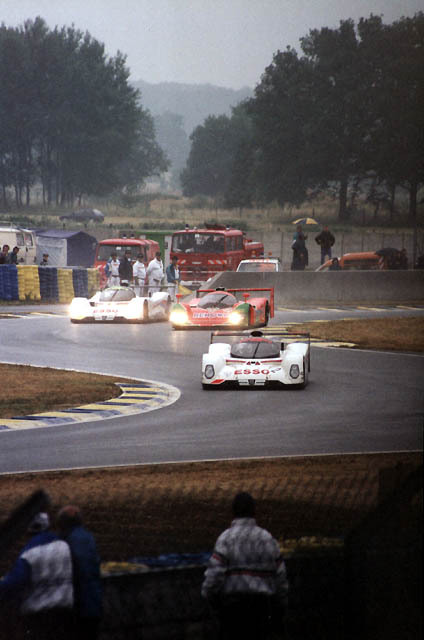 Even with the chicanes created for the 1990 race, the fastest cars are still travelling at speeds of over 200 mph on the Mulsanne. Although the Mulsanne is most definitely not a recognised public viewing area - and you run the risk of being called a "very naughty person" by any gendarme who finds you there - a visit to the two restaurants (even taking a meal there if you're lucky!) may give the chance to look over the fences or through the hedges. Much, much more difficult than it used to be years ago when it was an absolute must to go to the restaurants to climb the fences and watch the cars screaming past - at night, one of the most awesome sights in motorsport - trust me! 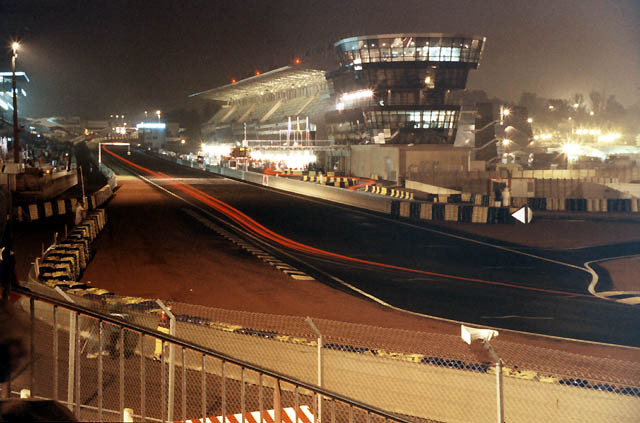 Even if you don't get to see anything,, its still worth a visit if you can find your way in the night, just to hear the cars - my abiding memory of my first visit to Le Mans. Mulsanne Corner remains a very popular viewing spot, day or night and even if you don't have your own transport, shuttle buses go to and from Mulsanne regularly from near the main entrance. 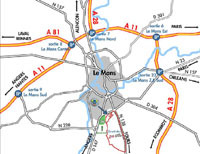 The car park for Mulsanne is situated a good way from the corner itself - about a ten minute walk - so if you have any difficulty walking, please bear this in mind. The walk is also completely unlit during the night, so a torch comes in handy. It is a popular spot so expect it to be crowded at all times. 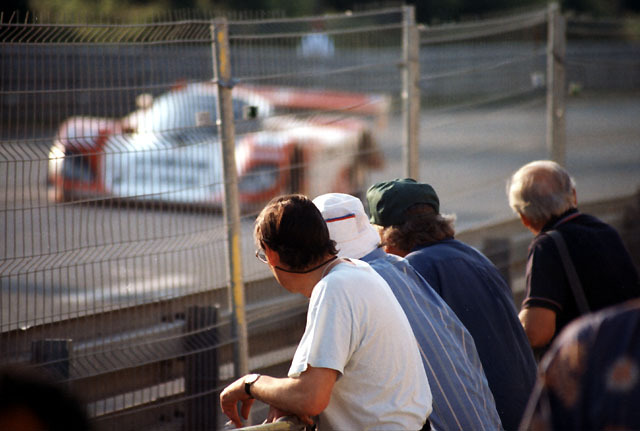 Once the cars come into view at Mulsanne Corner they are travelling reasonably slowly and the banking provided for spectators on the outside of the corner makes for a rare opportunity to take pictures without quite as much fencing in the way. There is also a big TV screen there. My recommendation? Go at night - and listen to the cars as they blast off down to Indianapolis! The Indianapolis/Arnage complex has always been one of my favourite spots and as with Mulsanne Corner, the bus excursions stop off here as well. The run off areas changed for the 2001 race and for many years the view hasn't been anything like as good as it once was. 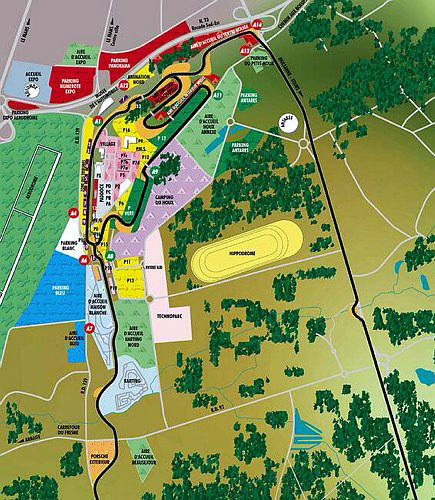 But between the 2015 and 2016 races, the ACO acquired land there and created a fantastic new spectator bank overlooking the entry to Indianapolis. You have to go there! For the photographers, sadly there is an awful lot of seriously intrusive fencing at Arnage, making photography very difficult but you can take some great shots from the new banking at Indianapolis. The Indianapolis/Arnage complex has become very popular over the last 10 years and more, so much so that the ACO has had to create not one but two overflow car parks in fields just down the road. The first is only 2-3 minutes away but the second is about a 10 minute walk away (which I can guarantee you will really feel on tired legs on Sunday lunchtime!). So we come to the end of the lap. As the cars exit the Porsche Curves they blast down the track before braking for the Ford Chicane. This is another good place to watch from, with long stretches of raised banking on the outside. (If you can't get onto the tribunes at the start of the race, think of watching it from here....). Just along from the Ford Chicane is the "Maison Blanche" grandstand (No. 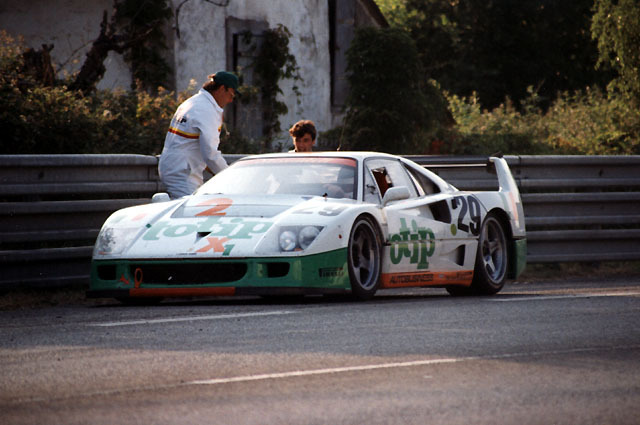 23), which affords a very good view of the cars as they enter the chicane and then blast up the straight. It was from here that I watched the sensational Volker Weidler in the Mazda in 1992! Another good view at night (but then all the views are good at night!). Want an idea where everything is.......? And here's a map from the ACO. It's a bit small and the definition isn't so hot, but as least you can see the general layout and the car parks!